While the flag of Sri Lanka didn’t officially exist until 1815, its roots – the lion imagery – are some of the oldest in the vexillological world. The lion symbolism was brought to Sri Lanka by Vijaya, Sri Lanka’s first king. Vijaya came to the island in 486 BC with 700 followers after being expelled from the Vanga Kingdom (present-day Bengal), establishing what would be known as the Sinhalese ethnic group. Vijaya’s father was Sinhabahu (which means lion-armed) who, according to a book called The Mahavamsa, was the offspring of a lion and princess. Vijaya’s nephew would succeed as ruler and use lion symbolism extensively as an homage to his uncle and the establishment of his kingdom. In 205 BC, a Indian noble named Elara invaded Sri Lanka and took power. Despite Sri Lankan texts describing Elara as a fair ruler, a Sri Lankan named Dutugemunu formed a resistance movement and eventually killed Elara in 162 BC. During his campaign, Dutugemunu and his followers fought under a banner depicting a lion holding a sword. The lion and sword banner would represent the Sri Lankan king until 1815, when Sri Lankan nobility ended the reign of King Sri Vikrama Rajasinha by officially recognizing England’s King George III as their ruler. Sri Lanka became known as British Ceylon, and, like the vast majority of English colonies, Sri Lanka’s flag was changed to a blue British ensign defaced by the seal of Ceylon. The lion and sword banner would be taken back to England and housed in the Royal Hospital Chelsea. 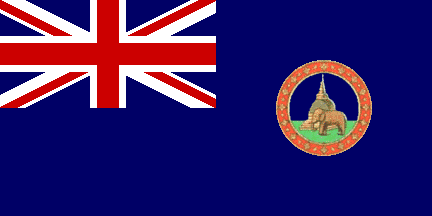 Flag of the Dominion of Ceylon from 1948-1951. By the early 20th century, support for Sri Lankan independence began to gain traction. One of the leaders of the independence movement was E. W. Perera, who was instrumental in removing a state of martial law in Sri Lanka during World War I. During a trip to England, Perera and Sri Lankan press baron D. R. Wijewardena found the original lion and sword banner in Chelsea and published a picture of it in a Sri Lankan newspaper to mark 100 years of British rule. This returned the lion symbolism to Sri Lankan public consciousness and made it a symbol of the independence movement. When Sri Lanka (still known as Ceylon) gained its independence in 1948, the lion and sword flag became the official banner of the new Dominion of Ceylon. Flag of the Dominion of Ceylon from 1951-1972. While the lion and sword imagery would largely remain the same, the flag would go through several changes to accurately represent the Sri Lankan people. 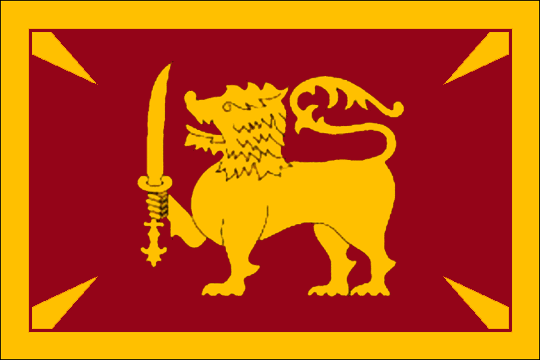 In 1951, two equal green and orange rectangles were added, representing Sri Lankan Hindus (Tamils) and Muslims (Moors) respectively, while the large maroon field behind the lion represented the Sinhalese majority. The yellow border surrounding all of the flags’ elements represents all Sri Lankans living together in harmony. When the country officially became known as Sri Lanka again in 1972, the four Sinhalese pines in the corners of the maroon field were changed to Bo leaves. These leaves represented four virtues of Buddhism: kindness, friendliness, happiness and equanimity. Naval ensign of Sri Lanka. Despite the main flag’s departure from its British ensign roots, Sri Lankan ensigns follow the same white, blue, and red system that is employed by the United Kingdom and its current and former territories. The Sri Lankan flag also keeps the standard British 1:2 aspect ratio.